Mark Kelly is fully qualified as a Site Suitability Assessor and has Professional Indemnity insurance to carry out Site Suitability Tests, throughout Ireland. An initial survey is generally carried out to ascertain the best location for the test holes, and subsequently the septic tank/percolation area. The client then arranges for the digging of the holes to the required size as directed, together with providing sufficient water to carry out the test. 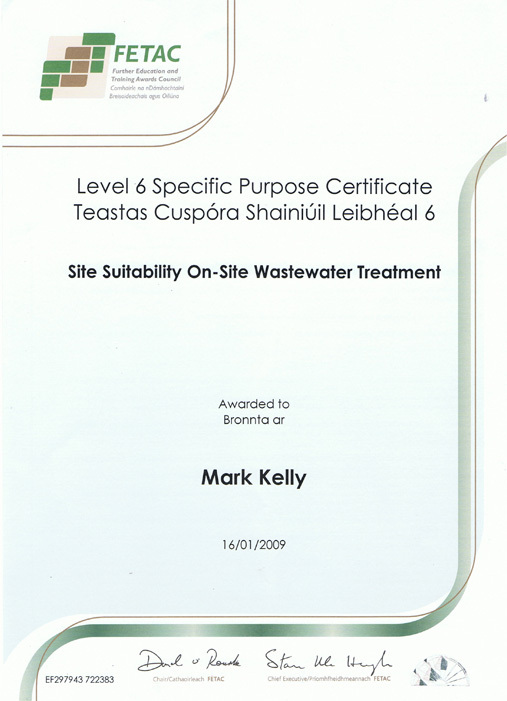 The test, including the presoaking, is then carried out by Mark Kelly under EPA guidelines, and a report and recommendation on the type of system most suitable for the site is included, with sketches, drawings and maps for local authorities. Furthermore; a standard planning condition currently, is that the as constructed percolation area be inspected, and certified. A report with photographs is then forwarded to the relevant local authority. Provided as standard by MK Architecture and Building Surveying.